Living room is the place where your guests appear first and it is the living room where the entire house comes together to watch TV or to spend some time together. Living room has a great importance as well as influence in the vastu shastra so you need to look after the perfect position of living room. It is said that the positive energy passes through the living room so if the living room won’t be positive then it might become an obstacle between you and your good luck. 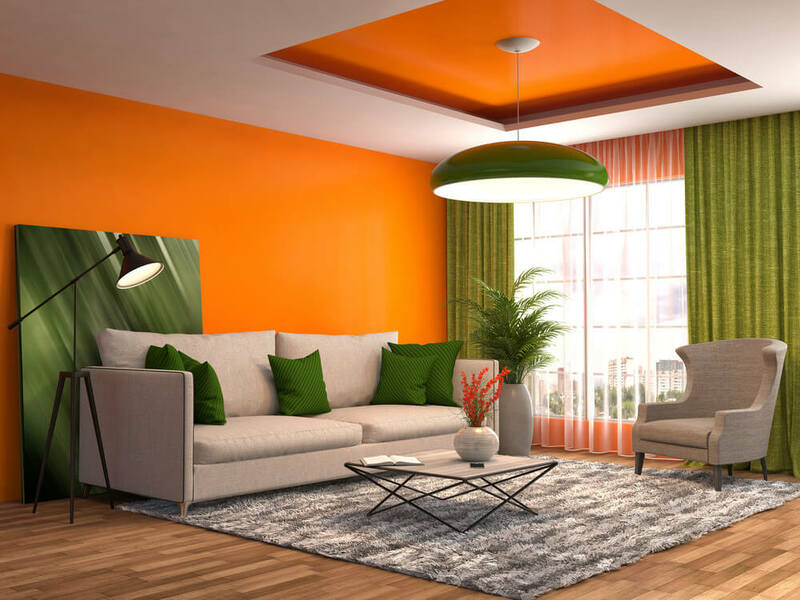 Bright colors such as yellow, white, orange etc are said to be too good for the living room so you can always choose painting which has these colors in it. 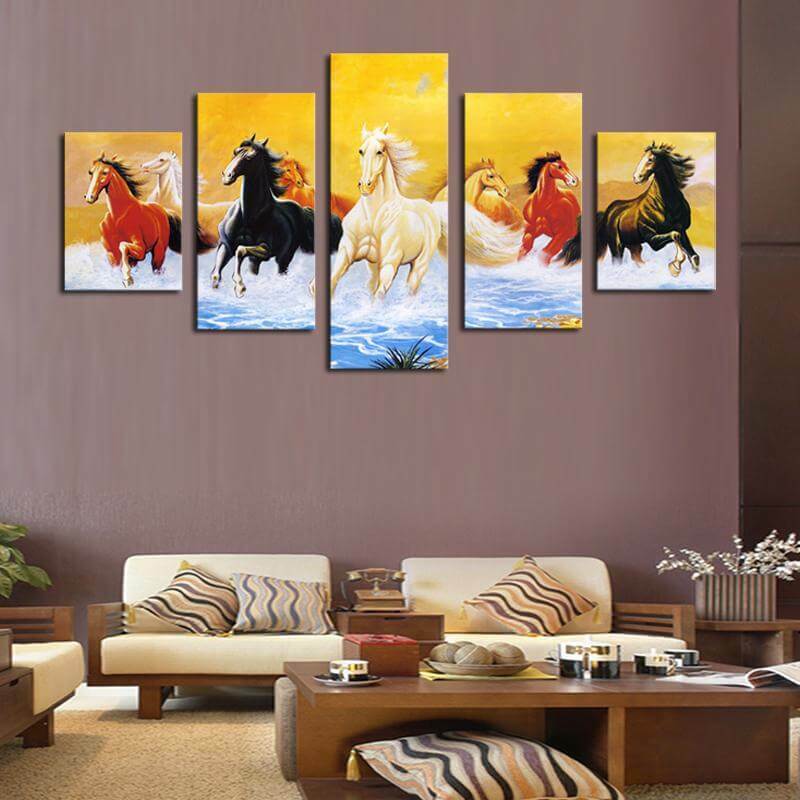 Running horse painting can prove to be extremely positive for your living room as this painting shows speed which would literally speed up your profit level and you would reach up to success in much shorter time. It is said that the picture of a horse brings achievements; you can hang this picture at the wall facing the window or door so that the picture could face the light through which the good look would also enter. Make sure you won’t have any picture of the sun in the southern wall of the room and make sure to have brown horse instead of black. If you can have picture of more than one horse in a single frame then it would be better for you. Apart from this you can have many other paintings in your living room after consulting with a good vastu consultant. 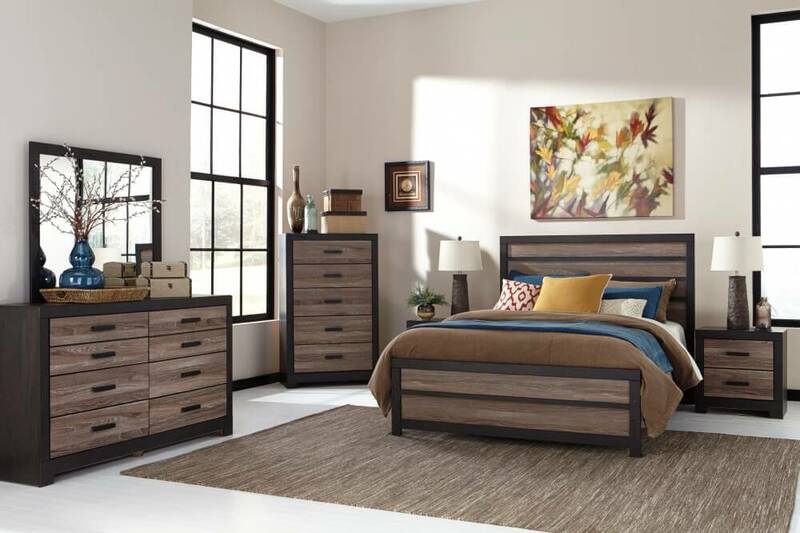 Bedroom is the place where relationship gets the settlements and it is said that the relationship between family members and especially the relationship between partners become strong if the vastu of the bedroom is perfect otherwise the breakage of the relationship can take place with the wrong vastu of the bedroom. Pictures come handy in rectifying the vastu defect and the best part about it is that it can make your bedroom more positive and lucky for you. 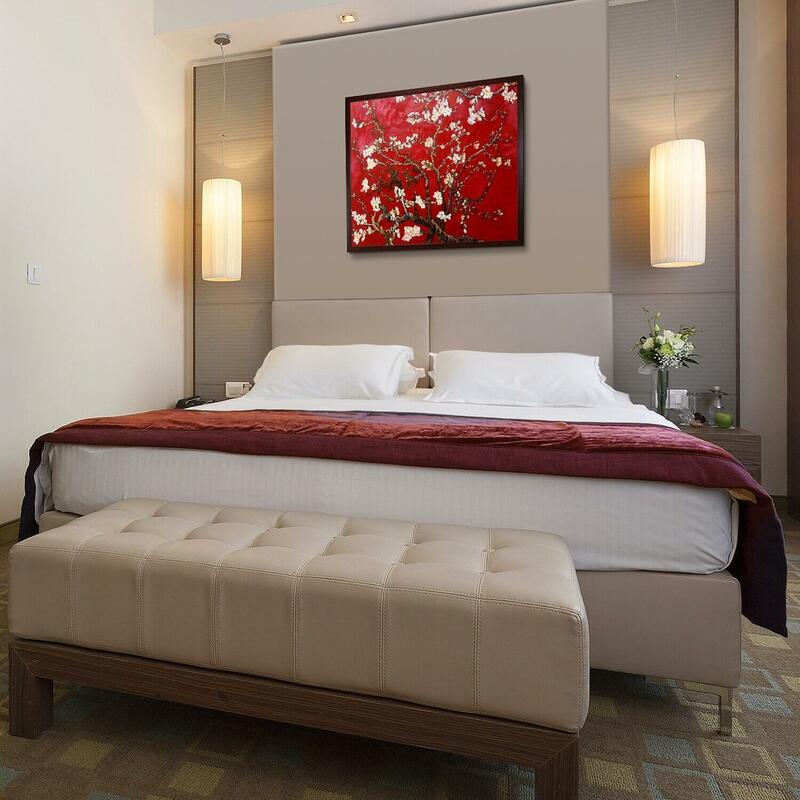 Almond blossoms picture can be a great option for you to get in your bedroom. Here in the painting you would be able to see a complete sky blue background on which there would be green branches drawn which are loaded with some white colored almond flowers. This painting no doubt looks amazing and beautifies the room. 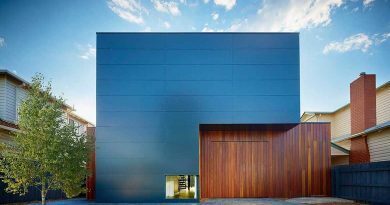 It is said that the color blue as well as white is the best choice for having it in your bedroom and it would bring tranquility in your home as well. Apple blossom painting, hummingbird picture with white flowers, pine forest pictures etc can be great options for the Vastu paintings for bedroom. 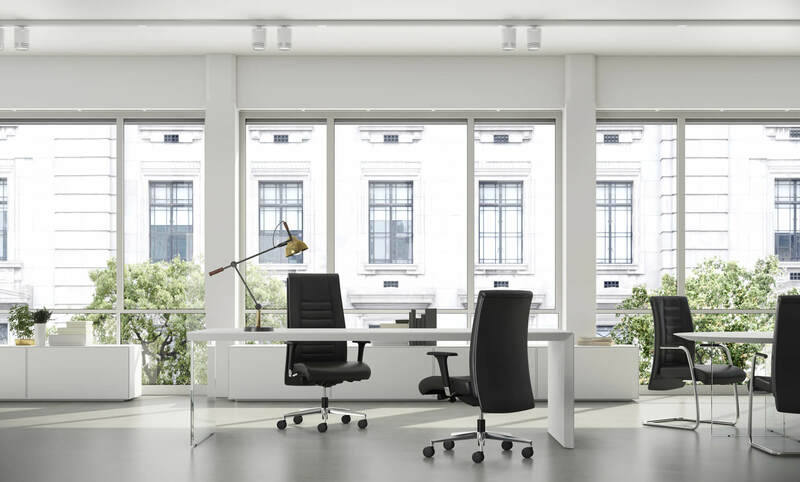 Office is the place you are earning money from so if the vastu of your office would be correct then you would be able to sense some great profit otherwise the wrong vastu of the office can even bring loss in business and you can even go through bankrupts, debts and many more. Having a good suitable painting in the office can bring you happiness and it would also make sure that you’re the negativity of the wrong vastu could be eliminated so the painting actually works as a vastu remedy in the office or in the work place. 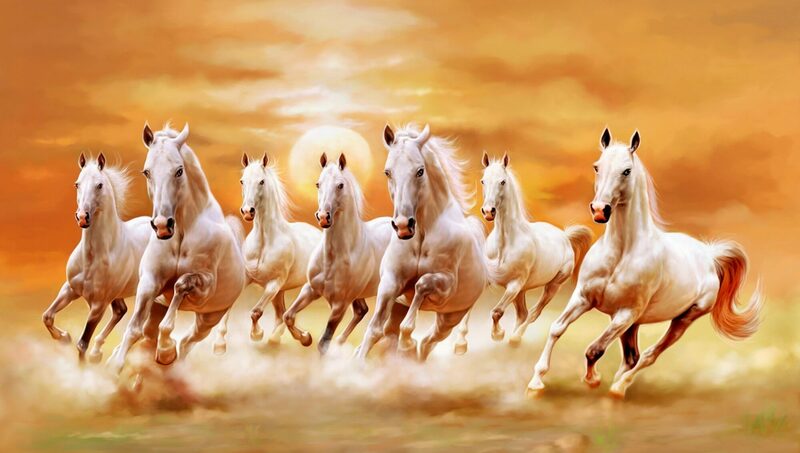 Seven running horse is one of the most powerful as well as positive vastu paintings for office and this painting would make sure that the speed of your success could increase day by day. Make sure to hang to have this painting in the working desk or you can eve hang it in the wall. This painting would also make sure that you could get fast promotions in your work. These were few lucky paintings that you can have in your home and place them in their respective places so that they could serve you with good luck as well as positivity around the house as well as in your life. You can even consult with a vastu expert before buying any such paintings and with the expert’s recommendations you can have paintings accordingly.